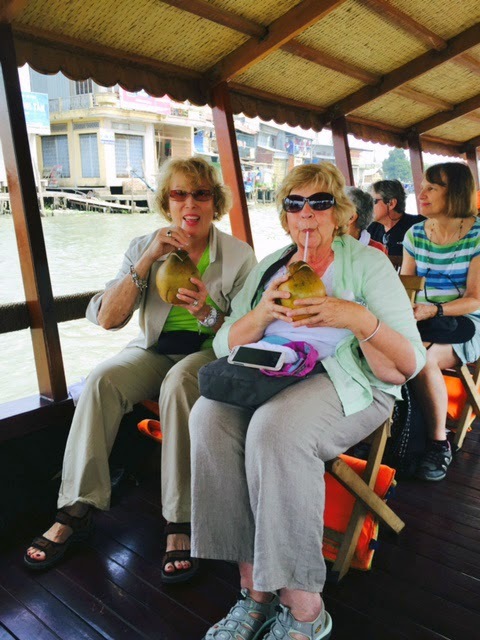 This is the final installment of Ann’s wonderful account of her “Ancient Kingdoms” trip to SE Asia. 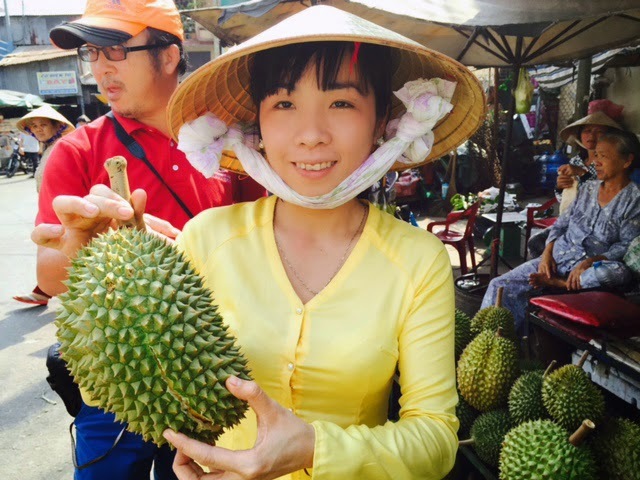 For the first entry covering Thailand, click here, for Laos, click here, and for Cambodia, click here. 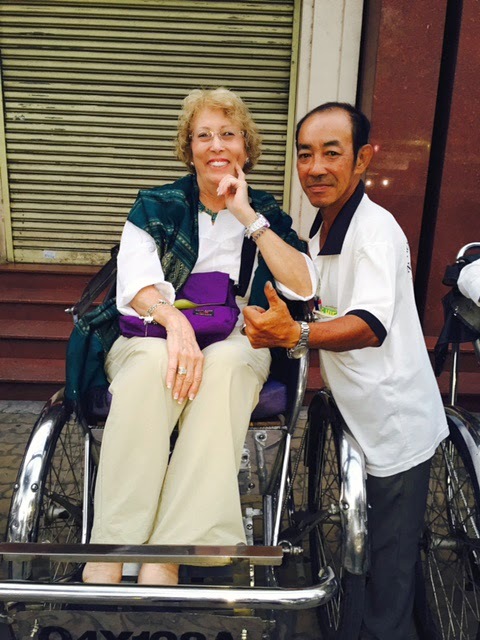 When we first arrived in Ho Chi Minh City on Feb. 12th, we were met at the airport by an adorable, loquacious and high spirited young woman, Anna, who was to be our local guide. There were also about 3 million Vietnamese at the arrivals gate picking up about 1 million family members arriving for Tet, the Vietnamese New Year beginning Feb. 19th, which is the most celebrated festival of the year. This holiday usually lasts about 7 days with families traveling from all over to be together. 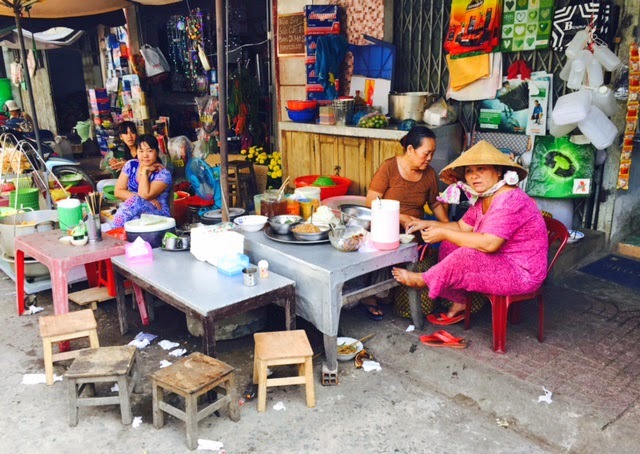 Since Tet occupies an important role in Vietnamese’s religious beliefs, they will begin their preparations well in advance of the upcoming New Year. In an effort to get rid of the bad luck of the old year, people will spend a few days cleaning their homes, polishing every utensil, or even repaint and decorate the house. The ancestral altar is given special attention, decorated with five kinds of fruits and votive papers, along with many religious rituals. Everybody, especially children, buy new clothes and shoes to wear on the first days of the New Year. People also try to pay all their debts and resolve all the arguments among colleagues, friends or family. Sounds like a wonderful idea to me! I was fortunate to be in India during Diwali, one of the biggest festivals of Hindus, celebrated with great enthusiasm and joyfulness. This festival is observed for five continuous days in a very similar way with scrubbing the house, an exchange of gifts, lots of cooking, buying new clothes and firecrackers being set off day and night! So one of the first things we learned is that most Vietnamese, especially in the south, continue to refer to Ho Chi Minh City as Saigon. Why? We were told Saigon sounds so much more romantic! And I certainly agree. And thanks to arriving just before Tet, the streets were exquisitely adorned with vibrant street decorations and there was certainly a buzz of happy anticipation in the air. What a contrast to the sad days we had just spent in Laos and Cambodia. We were driven directly to the heart of the city and the bustling square in front of the most famous landmark, the Notre Dame Cathedral, completed in 1880 to establish religious services for the French Colonialists. Notre-Dame Basilica to be exact is a magnificent building attracting not only Catholics but also many tourists for its neo-Romanesque style architecture and sacred atmosphere. Just next to it, also facing the square is the grand Central Post Office, not what you usually think of as a post office. This is another of Saigon’s most popular attractions, being the largest post office in Vietnam. Built between 1886 and 1891 by renowned architect Gustave Eiffel (of Eiffel Tower and Statue of Liberty fame), the vaulted roof and arched windows are reminiscent of early European railway stations. You don’t need to have postcards to send back home to enjoy the magnificent interior with its lineup of old fashioned working phone booths and hand painted maps on the walls that depict Saigon from 1892. I bought a beautiful paper fan here that is decorating one of my glass credenzas. Shortly after this stop, we were driven to our hotel, finally, to check in and relax a little before meeting for dinner where we enjoyed our first bowls of Pho! We were one of the luckiest groups on this particular tour to actually stay at the glorious Hotel Continental. Although OAT has tried for years to book rooms here, it is only recently that the Hotel finally released some for our use! This was the first Hotel built in 1880 in Vietnam in the French style of luxury and has been refurbished and remodeled on numerous occasions, but still exudes that old world charm that so captivated Graham Greene who used to stay in room 214, just down the hall from my own room in fact. The hotel features prominently in Greene’s novel, The Quiet American and in the two film adaptations. During our three night stay, Margaret and I arranged to sit outside those evenings and enjoy a glass of wine or beer in or near the very seats which both Michael Caine and Michael Redgrave occupied in their movies! And as others in our group drifted down before dinner, they all ended up joining us as well. The next day, we drove off for a two hour bus ride out to the countryside. Under normal circumstances, this drive should have taken us approximately 45 minutes! Ole tried to warn us about the madness of the traffic: thousands (and this is no exaggeration) of people on motorbikes whizzing past, three deep and packed from front end to rear, reminiscent of Deli but not nearly as insane. We were off to the Historic Relics and Cu Chi Tunnel Complex where we are going to see the Ben Duoc Tunnel, a unique architectural structure, a system of deep underground tunnels having several floors and alleys and branches like a spider web. These tunnels extend more than 157 miles underground with dining, living, and meeting rooms plus kitchens so it was possible to stay hidden for months at a time. 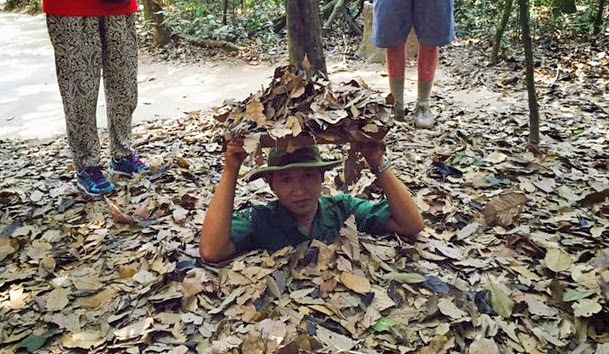 The Official Brochure states that this tunnel system embodies the strong will, intelligence and pride of the Cu Chi people in resistance to the American enemy. Several of us, including myself, actually squeezed down (in my case very carefully) the very narrow entrances to one of these tunnels, and crawled on our hands and knees in the dark on hard packed dirt for several minutes coming up at another opening. I was covered in dirt from head to toe when I was finally helped out of the tunnel. It was a very claustrophobic experience, the ceilings so low that you couldn’t lift your head, although other rooms were large enough to comfortably sit military personnel around a large table during strategic war talk meetings. One tunnel had a fully equipped hospital. Traffic is so horrendous that a normal 45 minute drive again took over two hours to return to city center which is sophisticated and teeming with young people enjoying life, full of beautiful parks & stunning flowers everywhere you look. 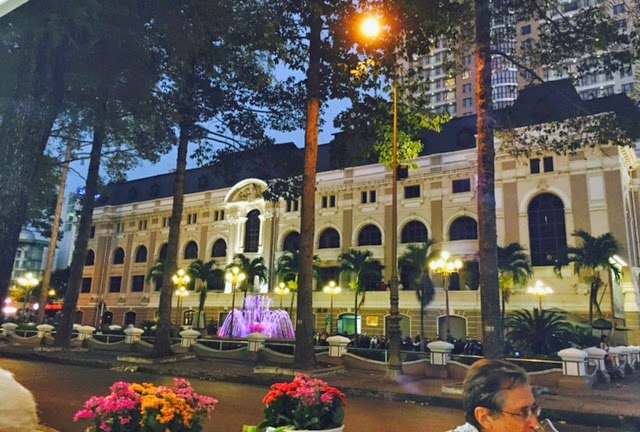 Saigon is a marvelous city, with magnificent French Colonial buildings including the stately Opera House directly across the street from my hotel. After a quick shower and change of clothes, we took a bus to the 45 minute Vietnamese Water Puppet Show, really for children, but with all the seats being filled primarily by adults. There was a lot of splashing around by a gazillion wooden puppets, colorfully painted, with wonderful Vietnamese music and singing accompanying all the theatrics. After the show, Ole escorted us back behind the theatre and there we saw how it was actually done because up until then I had been really trying to puzzle it out. Boy was I relieved to see that no one actually drowned executing all those ballet maneuvers with the puppets! Little did I know we were about to literally take our lives in our hands as each of us hopped up on a seat on the single passenger rickshaw bicycle with one gentlemen pedaling behind us as we headed into the crush of traffic just as dusk was approaching. With motorbikes, buses, taxis & cars whizzing all around us, riding in the front of the bike, unlike in Varanasi where our driver biked in front, felt far more dangerous from my perspective. It was hair-raising as we drove what felt like an hour clear across Saigon, but was probably more on the order of 20 minutes. I became deeply religious in those few moments when I thought someone was surely going to crash into me. We were finally dropped off on a street teeming with people, shops, food, and motorbikes again; here they are simply referred to as Hondas! We made our way into an alleyway and stepped into a restaurant where the owner was waiting for us. I don't think Tauck Tours takes their 5 star clients into places like this. There several of us took turns chopping & measuring ingredients for the chicken marinade which was one dish of many being prepared for our dinner. We also had a very excellent soup, a salad with indescribable vegetables and a stir fry platter of vegetables along with our chicken. Everything was very delicious. As soon as our bus dropped us back at the hotel, I went to the front desk and ordered a Hotel car to take me to the airport on Sunday – my last day, very reasonably priced, with tax in US dollars: $11:55. Everyone will be leaving at the crack of dawn; I'm the last to check out. That gives me a leisurely morning to pack and then stroll around a little as I haven't had a spare moment to even stand in front of the Opera House or walk around the block. Diagonally across from my hotel and the big square is a Louis Vuitton & up the street all the boutique stores you see on Rodeo Drive or Worth Avenue, a very "tony" neighborhood for sure. 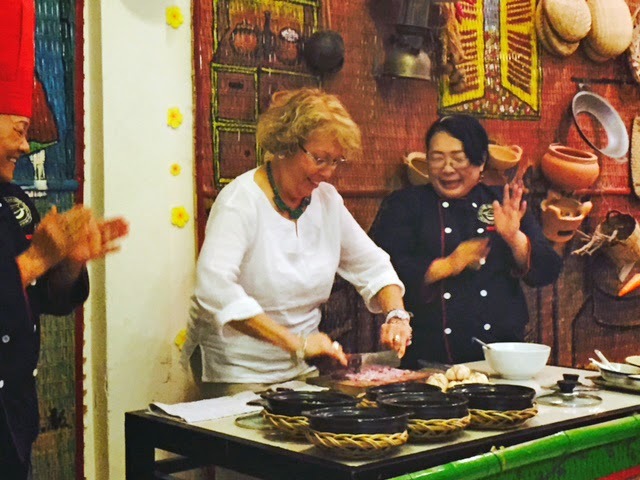 Our last day began with an interminable bus ride but as always, we pulled off the highway to visit “The Happy Room” as Ole always called our restroom stops, as well as sampling a delicious Vietnamese coffee. Who could resist, I had to bring back a small bag. 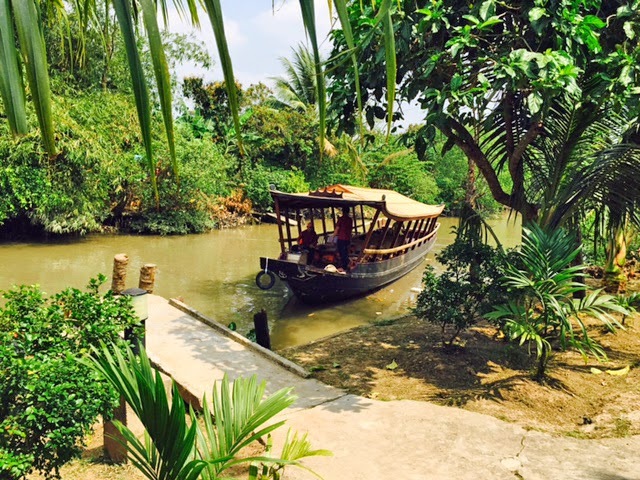 We finally arrived at a local market where we took a 2 minute ferry ride so we could board our boat for a cruise on the Mekong Delta River, stopping after half an hour for a lunch in a private home built in 1883, the fourth generation still living there, now a guest house which also caters to small groups for lunch. Lunch was served al fresco and featured a huge whole deep-fried fish and lots of side dishes. 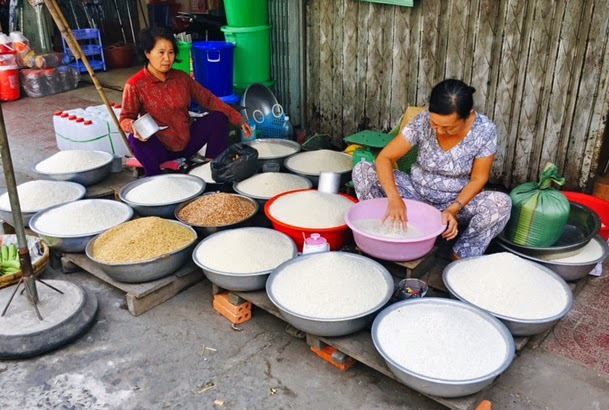 We continued the afternoon cruising on the Mekong, passing an enormous wholesale market floating on the water in full swing where retailers were loading up their boats to take back all kinds of food, fruit and other items to sell in their local areas. It’s a surprise where we're going for our Farewell Dinner, but after a glorious 10 minute hot shower, and a fast change of clothes, I ran down to meet Margaret for a drink in front of the hotel, before we meet the others. Ole presented each of us with a fully illustrated diary in detail of every day of our trip with his very own remarkable pen & ink drawings!! 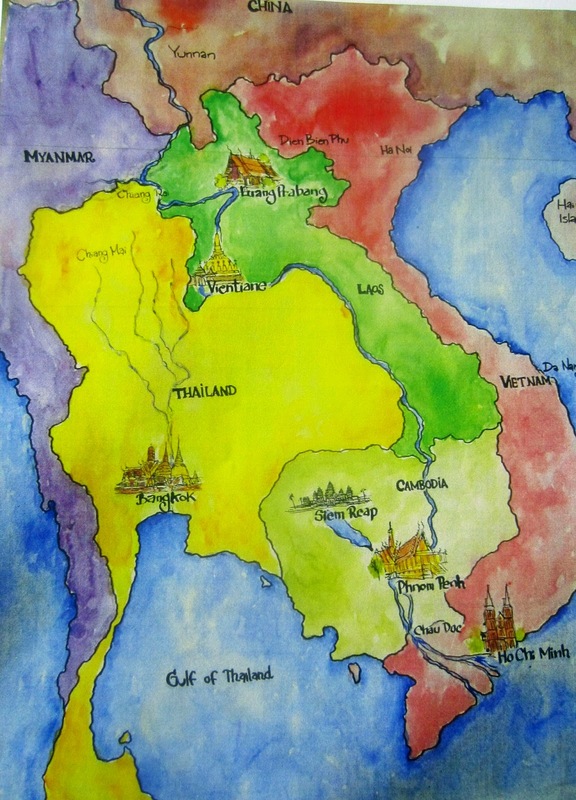 His colorful map of our four countries begins and ends this write up. We had a private room for our last dinner together where we all remarked on what a wonderful time we had and how much we appreciated Ole for all of his hard work. Afterwards, back in my hotel room, it felt bittersweet to realize it is all over. I am certainly relieved on the one hand as I am so ready to return home and see my husband and get back in the routine of my life. I have met some really wonderful people on this trip and hope to keep in touch. I just found out that Hiroko and I are the only two spending a good part of the day in the hotel the next day, so we have made plans to meet for breakfast, do a little sightseeing and shopping and have a bite of lunch before my car arrives. Her flight to Tokyo doesn’t leave until much later that evening. It was terrific meeting Margaret, my beer partner who said the nicest thing to me, “thank goodness you were on this trip as I really enjoyed your company”. I fell in love with Joan and Frank, lovebirds from California who had the most remarkable story to tell and exemplify how wonderful love is the second time around! Margie also said something so sweet to me, that it was fun being on this trip with me because I added such liveliness to the group. Others like Anne and Kevin and Dr. Frank and Hiroko, extended invitations to visit and I did in return. I enjoyed getting to know Ed and Silvia as well as Karl and Patty. 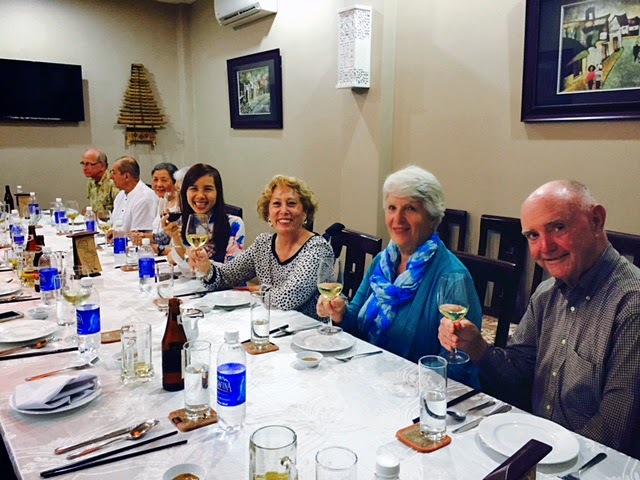 What a pleasure it was to be on this journey with such kind and engaging fellow travelers! Just before I left on this trip, I was suffering from my Vertigo and had undergone some draconian spinning to help relieve it which really didn’t, and had a shot in my knee so I could walk. My poor Chiropractor was working so hard to help my back stay in shape before this trip knowing how strenuous it was going to be. Amazingly, for the dizziness I just needed an arm to go up or down steps and the old knee held up remarkably well as did my back. I actually flew home in good shape, no pain anywhere. That’s what I call a successful adventure!